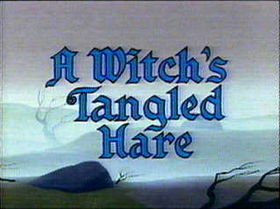 A Witch’s Tangled Hare is a 1959 Warner Bros. Looney Tunes theatrical cartoon short directed by Abe Levitow. 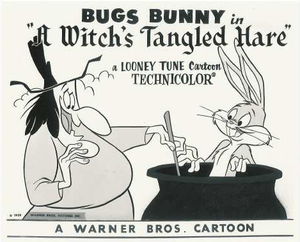 In this cartoon Mel Blanc plays voice roles for Bugs Bunny, while June Foray voices Witch Hazel. The cartoon makes many references to various plays by William Shakespeare (Hamlet, Macbeth, Romeo and Juliet, and As You Like It). The cartoon opens with the poet, who looks similar to William Shakespeare, trying to write and coming across a castle with a mailbox with "Macbeth" written on it. At this he begins to write a story based on this title. He hears the loud screeching laugh of Witch Hazel and watches her stir her cauldron. The witch has Bugs Bunny trapped, sleeping on a platter and wakes him up. He believes the cauldron to be a bath and readily climbs in, only realising his mistake after reading her open recipe book. He quickly jumps out of the boiling cauldron and runs away from Witch Hazel, towards the castle, when she tries to attack him with a meat cleaver. Witch Hazel pursues Bugs Bunny on her flying broomstick. We then see the poet again trying to write after Bugs and the witch have departed. At the castle, the chase continues and as Bugs Bunny acts as Romeo to try and trick Witch Hazel, who starts to quote Juliet's lines from the play but soon the two improvise. Witch Hazel jumps out of castle window as Bugs pretends that he will catch her and rapidly runs off. As Bugs runs out from the castle he runs into the poet who is crying because he will never be a writer. Bugs finds out that he is not William Shakespeare, but is actually called Sam Crubish. The witch hears this and it appears that the two know each other but haven't seen each other in a while because Crubish had the wrong apartment number (2B). The poet and Witch Hazel leave talking about who made the mistake of saying "2B" and the cartoon closes with Bugs Bunny quoting the famous line from Hamlet - "To be, or not to be". This page uses content from Wikipedia. The original article was at A Witch's Tangled Hare. The list of authors can be seen in the page history. As with Loonipedia, the text of Wikipedia is available under the GNU Free Documentation License.